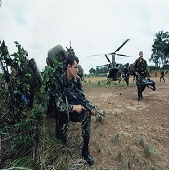 In the conflict ravaged former British Colony of Sierra Leone, on 25 August 2000, a R IRISH patrol was captured by the West Side Boys. The patrol members were held hostages in Gberi Bana North of the Rokel Creek. In response to the crisis, the UK launched Operation BARRAS deploying both D Squadron 22 SAS and A Company 1 PARA to recover the hostages and defeat the West Side Boys. This scenario recreates A Company 1 PARA’s clearance of Magbeni on 10 September 2000 and is based on an account written by Major Lowe, the company commander in the British Army’s Tropical Operations Manual. In real life, A Company, 1 PARA was completely successful in clearing Magbeni as were D Squadron, 22 SAS at Gberi Bana and Operation BARRAS effectively removed the West Side Boys as an actor in the Sierra Leone conflict. This mission is a Blue vs AI mission only and requires a fully patched version of CMSF with the British Forces Module. 1 Comment on "Op BARRAS – A Coy 1 PARA Sierra Leone"
British Infantry Tempo Camo Mod. – Puts the Paras in a green temperate uniform. African Theater pack – African faces. African Terrain v1.20 – Some buildings, grass etc. All four of the above mods can be found at the BFC Repository but are not necessary to play the scenario. But they do look cool.